Place salmon fillets on a foil covered cookie sheet and season with salt and pepper. 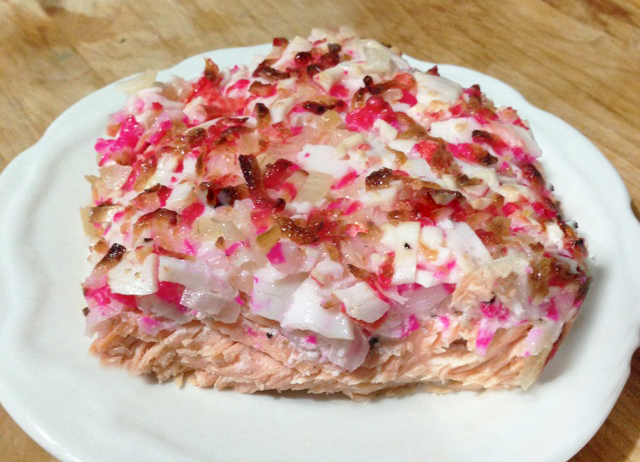 In a bowl, mix kamaboko, imitation crab, onions, and mayonnaise. Add more mayonnaise if mixture is too dry. Mixture should look like a spread/dip. Spread kamaboko mixture onto each salmon so that the tops are completely covered. Bake salmon at 350° F for10-15 minutes or until done. Broil salmon for 5-10 minutes to brown tops.